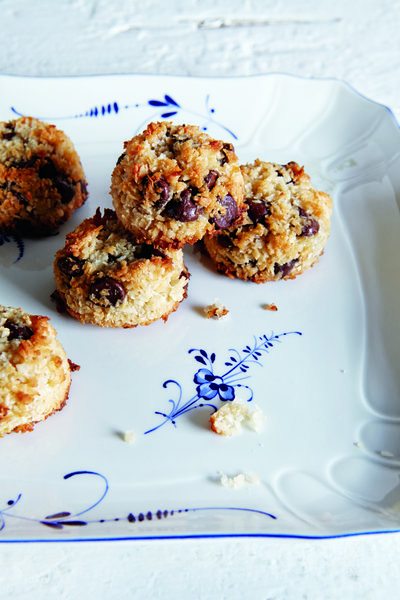 These cute bite-size treats are crisp on the outside, slightly moist on the inside, and loaded with coconut chocolate flavor. Be careful not to add the chocolate chips to the warm dough too soon, or they’ll melt. Combine the coconut, flour, milk, maple syrup, salt, cinnamon, and vanilla in a saucepan over medium heat and warm, stirring until the dough is able to stick together, about 2 minutes. Remove from the heat and let cool until barely warm. Fold the chocolate chips into the dough. Scoop out 2-tablespoon-size mounds, press them into tight balls, place them on the prepared baking sheet, and bake until tops are lightly browned, 25 minutes. Cool completely, gently loosen the cookies with a spatula, and enjoy.